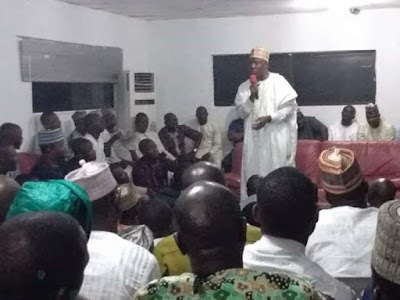 The Senate President, Dr Bukola Saraki yesterday told Youths of Kwara State that the APC as a party does not have the interest of kwara and kwarans in its agenda. Reacting , the Senate president urged the youths to bear with him the present hardship caused by deliberate marginalization of kwara state in the scheme of things by the same Government he had laboured hard to bring in place . Dr Saraki also noted that the incoming government of Atiku will return Nigeria back to path of development where youths will be empowered in large numbers . He said "Ever since I left the party(APC) as your representative at the National level, who among those calling themselves APC members in Kwara today have been included in any National affairs of APC ? Instead of being included, they have programmed them to take orders from Lagos, but I tell them Kwara will never be subject under any state as Kong as I live "
The National leader of PDP also used the medium to reassure local government workers and ex councilors that their salary arrears will soon be cleared .